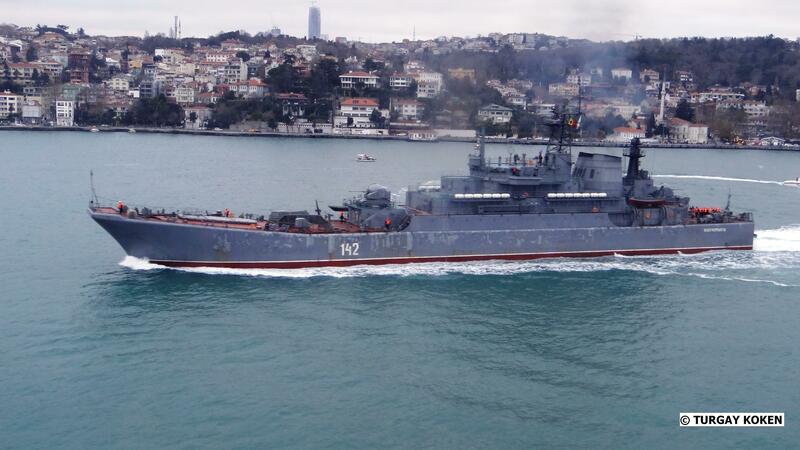 Russian large landing ship Ropucha class 142 Novocherkassk, during her transit through Bosphorus. Photo: Turgay Köken. Used with permission. On the last day of 2012 the Russian large landing ship Novocherkassk passed through the Bosphorus and on the first day of 2013 she entered into the Aegean, joining other Russian warships in the region. Boris Chilkin class tanker Ivan Bubnov. The Uda class tanker Lena is in the Gulf of Biscay heading for the Mediterranean. If you have any information about the naval activities of Russians in the region please let me know. Be joined by a Baltic Fleet Project 956 on a rare deployment soon. With a salvage tug of course. Nastoychivyy 610. Salvage tug name not known. The Project 1174 large landing ship was built by the Yantar Shipbuilding Plant at Kalingrad for the Russian Navy. Three ships were built, the Ivan Rogov, the Aleksandr Nikolaev and the Mitrofan Moskalenko. The Russian Navy decommissioned Ivan Rogov in 1996 and Aleksandr Nikolaev in 1997. The last ship in the class, Mitrofan Moskalenko is still in service with the Russian Navy.